52 weeks after Cumbria Zoo Company Ltd took full control of the zoo, we look back at the 52 positive changes we’ve made and look forward to the year ahead. Today marks one whole year, 365 days, 52 weeks, since CZCL took full control of Safari Zoo. It’s been a long, rollercoaster ride of a 52 weeks but it has also flown in many ways! We’ve been through everything; threats of closure, the serious time of applying for, and the nerve wrecking, gut wrenching waiting game to see if we were to be awarded our first, very own, license to operate. It’s been tough, we have the grey hairs and wrinkles to prove it, but we’ve made it through a whole 12 months and we have made some great strides in animal welfare with new and revamped enclosures, dietary revolutions, brand new education team and partnership with the best veterinary care team. To mark this monumental day, we have compiled our celebration of CZCL achievements, so make yourself a brew, and maybe a cheeky snack as we bring you our unfolding story. We feel immensely proud of what we have achieved in such a short space of time….with very little funds…but we also know we cannot become complacent and we know the works cannot, and will not, stop here – there is a lot more work to be done and as a result 2018 will be even tougher, but also a lot of fun! Park development – watch this space, there will be loads coming in 2018! We need your continued support throughout 2018 so please come and see us to say hello! Cumbria Zoo took control of Safari Zoo in its entirety on 23rd January and start to put a divided park (physically and mentally) back together. Cumbria Zoo’s first formal inspection took place over 13th and 14th March 2017 following our application to take over both license and zoo operator roles. In response to the recommendation by government inspectors in the inspection report, Andreas Kauffman joined the team in April 2017 filling the role as Animal Director. Cumbria Zoo Get Their Very Own License! On Tuesday 9th May the hearing took place at Barrow Town Hall to reach the decision on granting Cumbria Zoo a License. After an intense full day, at approximately 4:40pm we received the news that we had the backing of inspectors and the council and were given our license to operate. On Thursday 11th May we proudly collected our License from Barrow Town Hall. Now in operation and under immense scrutiny from the media due to historical associations, Cumbria Zoo wanted to show the world how we were different, to do so we threw open our doors with free entry (excluding school holidays), to enable everyone – even doubters – to visit and see the changes we were making. We added new experiences and new all access wristband options for visitors to enable viewing of areas not normally visible to the public, thus demonstrating the positive changes we were making. In addition to throwing our doors open to show who we are and what we are about, we started to build community and zoo relationships through new initiatives. Our new membership scheme was launched towards the end of 2017 and we held focussed animal days corresponding to international celebrations. In September we held our Red Panda Party as a celebration of our Tink and Pan our resident (and popular) Red Panda residents. Cumbria Zoo operate under the guidance of a full time Vet Nurse. In 2017 the Vet team was enhanced with the coupling with a highly regarded external Veterinary Consultant making weekly visits to site and partnership with a local Veterinary Practice who provide call out/emergency support and consultation. Our onsite veterinary team was strengthened with the recruitment of an experienced, fully qualified, registered veterinary nurse in May 2017 who joined the team serving a dual role as animal keeper and support to the existing veterinary team. During 2017 our animal care team has expanded significantly with recruitment of 6 new Keepers. The new additions to the team bring a range of qualifications (including L3 DMZZA) and experience of working within a range of International and UK Zoos and animal parks. As well as strengthening the teams via recruitment, throughout 2017 Cumbria zoo staff have actively worked to improve knowledge and skills within the existing teams through training, qualifications and sharing of best practice. Managers and Supervisors are actively working towards Management and Leadership Qualifications whilst Members of the office team are undertaking Business, Administration and IT vocational qualifications. Animal Care teams are enlisted onto DMZAA (Diploma in Management of Zoos and Aquariums) and have attended workshops with representatives from partner zoos on animal behaviour, care and wellbeing including workshops focussed on Tapirs, Wolves, Bears, Giraffe and Zebra. When we first took over, one of the first things our Retail team wanted to do was to revise the pricing, retail and sales strategies for our Gift Shop. As our gift shop is accessible without park entry one of our goals was to put the gift shop in the mind of locals and passers-by when looking for unique gifts. Our Retail team started off at Easter, addressing the pricing, packaging and appearance of our imported Bali goods including Masks, Windchimes and ornamental animals (Zebras and Flamingos). To our delight the method was a huge success with the majority of lines selling out by July with a number of visitors returned to us looking to repurchase or make an additional purchase based on what they had seen during an early visit. 2017 saw the addition of qualified, experienced, Teaching Assistant Lyndsay to the team as Education Officer, Lyndsay worked as a keeper here at Safari Zoo during her studies so is the perfect blend of “Animal” and “Education”. Since joining the team Lyndsay has designed new workshops and worksheets and developed networks with peers in other Zoos through attendance at Industry Recognised Workshops and Education workshops. Lyndsay has worked tirelessly to redevelop relationships with local schools which were severely damaged by the negative press during the first half of the year, organising and leading 101 group visits since joining the team with records showing that this is the busiest December for group visits in the history of Safari Zoo. Education work will continue into 2018 with the development of a Native Species Workshop and Outreach Programmes and the hosting of environmental events. Cumbria Zoo began working with Uncle Pablo and Co mid-2017 to refresh our online offer and increase digital marketing presence and accessibility. This began with an initial launch of a new look website in June 2017. Growth will continue in 2018 with Phase 2 of the Website development which will include interactive members areas, increased provision for education and children and ensure Cumbria Zoo maintains a professional and informative digital media presence. Earlier this year our Bear keepers began to notice Mona was suffering some hair loss, this began to increase around the summer time with significant loss around flanks, head neck and shoulders. Our veterinary team in consultation with peers within UK Zoos identified Andean Bear Alopecia Syndrome (ABAS) commonly amongst captive bears, particularly sexually mature females. Professionals identified Apoquel as a potential treatment following successful treatment of the condition in three Andean Bears as reported earlier in the Journal of Zoo and Wildlife Medicine: September 2017. Apoquel is an oral medication taken with food usually prescribed to dogs for the treatment and Control of pruritus associated with allergic dermatitis and control of atopic dermatitis in dogs. Since commencing the treatment we have noticed a marked improvement in Mona’s temperament and significant hair growth on head and shoulders, unfortunately the hair on Mona’s flanks seems to be a bit more stubborn but we continue to see a marked improvement daily. Visitors will recall meeting our reindeer herd in their enclosure near to the Maki restaurant during the first half of 2017. Cumbria Zoo identified the need for a new home for our antlered ami’s as the ground had a tendency to get rather boggy in wet weather. An area adjacent to the playground near the main entrance was identified as prime location and works began for the Reindeer Relocate in June 2017. Our maintenance team started with works on the ground, ensuring appropriate drainage, foundations and surfaces were laid. Shelter and housing provision and feeding troughs capable of holding a hearty feast were added as finishing touches. Mid 2017 it was noticed that the hooves of Eloise, our 8-year-old resident Kordofan giraffe, were growing at such a speed that they were not wearing down naturally on the hard surface of her enclosure which would usually happen naturally and as a result was experiencing issues with overgrown hooves. If left untreated this is a condition which can lead into ankle, leg and knee problems later in life if left untreated. Our veterinary team identified the need to undertake a procedure under General Anaesthetic on 7th November to trim back her hooves. Prior to the procedure our keepers had to ensure the area was safe for both Eloise and the Veterinary team and reduced the size of her enclosure using safely stacked bales of hay, they then worked with Eloise to encourage her to enter and feel confident in this area. The procedure took place as planned on 7th November and Eloise was back on her feet and moving well within the day. Going forwards our Giraffe keepers are working with Eloise to train her to present her feet to them to enable minor filing/trimming to avoid the need for her to go under general anaesthetic should the problem return in the future. Many animals at Safari Zoo are here as part of Endangered Species Programmes. Snow Leopards are extremely precious and these programmes are vital for future survival of the species’. Twin Snow Leopard cubs Miska and Nastasja were born in the park on 11th June 2016. On Monday 16th October we waved goodbye to the stunningly beautiful Miska who set off on her travels to Melbourne Zoo where she will play an important role in the Snow Leopard EEP after being genetically paired with a male Snow Leopard from Germany. A favourite amongst our cat keepers, Miska was born here at the park on 11th June 2016 to dad Wolfgang (from Salzburg Zoo) and Mum Kadi (from Helsinki Zoo). Update 17th December 2017 – Miska has settled into her new home at Melbourne Zoo and has recently moved into a new home as part of the newly-developed Carnivores Trail exhibit. Drainage works within animal enclosures have figured in the maintenance teams’ ground works over the Summer. The team prioritised those areas which needed attention most to improve animal welfare conditions with new drainage systems being installed in Pygmy Hippo, Tapir, Reindeer and Lion enclosures. Spotight on Lions: In September 2017 our Maintenance team began work on the Lion enclosure which was proving to become boggy in heavy rain due water laying on the dense impenetrable clay ground. Land drains were created by digging out a path and channel and backfilling the channel with clean stone to pull the water away. The remainder of the path was then filled up with rock and smaller stone and finally topped with a good layer of bark to make it kinder on the paws. The ultimate test came during the Cumbrian downpours in November 2017, when we witnessed a noticeable improvement in the surfaces within the enclosure. In 2018 we will continue to improve drainage onsite, starting with the Africa field and Kangaroo Zone/The plan will involve tonnes of stone, plant hire, Pumps and Piping and will prove to be a costly but beneficial programme for the resident animals, providing year round outside access for Giraffe, Zebra, Rhino, Wildebeest and Nyala. Cumbria Zoo welcome support from local companies and individuals who would like to sponsor materials or donate their time to help us complete this programme ahead of schedule. Ineffective drainage in and around the Pygmy Hippo enclosure, especially the house, meant the enclosure tended to become a bit soggy in wet weather. Our Maintenance team began work on the Hippo Hardstand which was proving to become boggy in heavy rain, the surface was scraped, resurfaced and compacted to provide a sturdy external area, accessible throughout the year. The ultimate test came during the Cumbrian downpours in November 2017, when we witnessed a noticeable improvement in the surfaces within the enclosure. 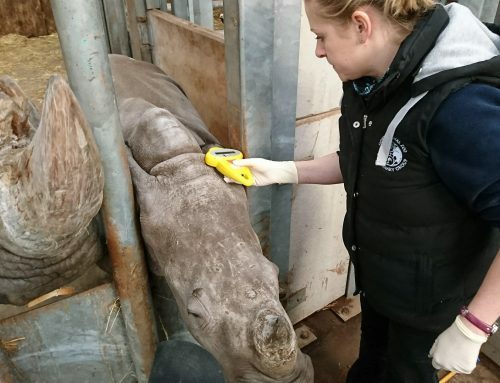 In conjunction with our veterinary consultants, all animal diets were reviewed and approved or amended where necessary as a priority activity on Cumbria Zoo taking control of the park. We now receive a substantial weekly fresh food order from a North West fruit and veg supplier and amendments to the giraffe diet mean we now import their food from Belgium. Things took a spooky turn here on 21st October as we noticed some strange activity in the site of the old gift shop. Some zombies had taken up residence in an abandoned tent, witches were busy plotting over a cauldron, possessed dolls were laying await in the bedroom and some cheeky skeletons were throwing themselves a dinner party complete with butler! Some of the Safari Zoo Team became possessed for 2 weeks by werewolves, enraged rabbits and skeletons doing their best to scare off our visitors and keep the place to theirselves – at times we could hear the screams from outside but were powerless against the dark forces! Almost 11000 visitors came to see our creepy squatters during the Cumbria and Lancashire half terms and although we’ve managed to rid ourselves of the spirits for now, there is no hope of them staying away next year after receiving such a welcome! We were very lucky this year at Safari Zoo as Santa chose us to be the hub of activity for his logistical operations and planning for making his way around the entire world on Christmas Eve. Our Maintenance and Events team swiftly exorcised the Halloween squatters to make room for the arrival of polar bears, penguins, reindeer and a host of lights into the Winter Wonderland. Within 19 days Santa’s house was decorated and Santa took up residence on Saturday 25th November, meeting almost 2500 Safari Zoo visitors before flying off on Christmas Eve. Early in 2017 each penguin underwent a foot check, weighing, ID check (scan for chip) and housing review. Our veterinary team identified that the resident waddle of penguins was potentially at risk of Bumblefoot. “Bumblefoot” may sound cute but it is a very serious disease which poses a risk to the lives of our feathered friends. In this instance the threat was posed as a result of a uniform surface in the enclosure. What followed was a rebirth of our penguin enclosure to include a range of surfaces – if you look closely when you visit you will see surfaces of sand, an area of large pebbles, an area of smaller pebbles (consideration is given to size to make sure they cannot be eaten – penguins are quite the gannets!) and a lovely shiny new 20,000 litre pool for swimming. The water in the pool is regularly changed – a minimum of twice a week in the hotter Summer months – , a new filter and pump system was purchased and installed by our in-house maintenance team and, after some internal trials, a new algae eating liquid which is added to the water was purchased, all in a bid to help maintain a clean and safe pool for our beaked buddies. This gave us food for thought for our other resident more stationary birds and focus fell on the flamingos. Now, the flamingos are more often than not seen around the outdoor pool during the day when you visit, this is where they are most content, but consideration had to be given to their indoor housing which is adjacent to the vulture aviary. The indoor house benefits from underfloor heating making sure they have toastie toes, but as you will notice, they like to spend a lot of time in the water so focus fell on maintaining appropriate temperatures in the pool. A firm favourite with our visitors, our Resident Red Panda pair, Tink and Pan, always seemed happy to plod around their enclosure but, we looked at it and decided it needed a revamp, brightening up and just generally be “more panda”! So, that’s what we started work on in April 2018. Designed in collaboration between our Panda Keepers and Maintenance team the new-look enclosure started to take place very quickly! Works completed include drainage, new safe staff access, new improved flooring, ponds, waterfall and climbing apparatus to keep our bushy tailed friends entertained. As most of you will be aware, this year has been incredibly tough for the team here and we at Cumbria Zoo wanted to demonstrate to our followers that we value their ongoing support and the strength this gives us, as a team. In September we developed a new, bigger, better and more rewarding Membership Programme which enables members to get closer to the animals and their carers with specific activities, feedings, unlimited entry, talks, themed events and most importantly the chance to get to know us more and be confident in what we, as a company, are about. In October 2017 we revamped our Adoption Programme to provide adoptees with bigger rewards including dedicated adopter’s days which will allow adoptees to meet the animal carers, their adopted animals, to take part in close encounters, to learn about the origin and family trees of our residents and also to understand the vital role zoos play in conserving species in the wild. This is just two of the ways we plan to give back to our followers and we will continue to develop new initiatives to enable you, our supporters, the chance to become more involved in 2018. Following reports of break-ins at fellow Zoos and Animal Parks where Rhino were targeted for their horns our maintenance team installed an intruder alarm in the Africa building, keeping our chunky monkeys safe and secure! Other security developments include the installation of a new CCTV system in our gift shop. Developments included improved pathways and more secure fencing. We were aware that the resident lemurs in our bear house who are free to roam the World Wide Safari, did not have outdoor access in inclement weather. Our brilliant maintenance team started work in early 2017 on an external catchment area for the troop, providing year round access to fresh air in a safe, controlled area. Records showed that tortoises had, previously, been able to get too close to the electric fence on their enclosure which is shared with the White Handed Gibbons and Spider Monkeys. An additional layer of fencing was added using logs to keep our hard-shelled buddies in and well away from the electric fencing, avoiding potential contact and injury. December Update: The tortoises have now moved to their very own Tortoise Territory in the Tropical House which they share with Stanley, our resident Sloth. Internal office space was refurbished and transformed into additional indoor lemur housing for our ringtail troop in mid 2017. It had been noted that the area in which Lemur feeding takes place became crowded and potentially uncontrolled during the public feeding times. Our maintenance team (who have clearly been busy this year!) developed a separate feeding area which reduces the number at any one given time and a linked, designated queueing system – this has ensured a controlled feeding session which is both less stressful for the animals, less chaotic for the keepers and much more of an exclusive experience for the visitors. Our lovely lemurs had their diets revamped in 2017, with the addition of Lemur Pap – a mixture handmade by our loving keepers to the following recipe; 10 bags black tea in 2l water steeped for 10 min, add 100g raisins and 540g polenta and some honey to sweeten; let cool down when cool stir in 30g Omnivite (vitamin and mineral supplement), dash of salt, 1 shot olive oil, 1 shot Sanostol (or any other vitamin and mineral supply for human children), 2 tablets D3 (Calcipot), 20g oak bark, 20g brewer’s yeast, feed lime. The pap provides our resident lemurs with important tannins that they would usually get naturally in the wild and has been well received by our stripe-y tailed pals. 2017 saw the implementation and installation of self-filling water troughs which provide numerous residents with an endless fresh and clean drinking supply. Self-filling troughs have been installed in the Africa building, Cat houses, Kanagroo houses and as external water supplies in the World Wide Safari area. 2017 saw the arrival of babies galore in the park, 103 babies in total! Including newest Rhino calf Zahra (10/11/2017) and Giraffe calves Ekundayo (21/03/2017) and Weller (12/04/2017). Visit us the weekend of the 27th and 28th for our first birthday party to say hello to the babies and their mums in our Africa house. Many animals at Safari Zoo are here as part of Endangered Species Programmes. Pygmy Hippos are classified as endangered with only 2,000 remaining in the wild. Quma, one of the resident pygmy hippos here at Safari Zoo and genetically important to the breeding program, left us in July 2017 to start a new life at Pairi Daiza in Belgium. Squirrel Monkeys are a firm favourite with visitors but they can get a little over confident, making a bit of a nuisance of themselves, climbing on people and had been the cause of a number of “nibbles” in early 2017. In response we have developed a beautiful new squirrel monkey enclosure with room to roam securely and safely and to still be a well-loved feature within the park. Incorporating anything a tortoise could need or want including substrate, heating, lighting. The area is now a firm favourite with our hard-shelled friends. The installation of a pulley system by our onsite maintenance team in mid-2017 provided a safer working environment for our Africa keepers and supported natural feeding for the resident giraffe tower, enabling them to reach up high for a nibble as they would in the wild. UV bulbs were installed in Tortoise, Tamarin, Squirrel Monkey, Howler Monkey and Cockatoo housing, supporting health and growth, UV plays a key role in the production of Vitamin D3, which is necessary in the absorption and metabolism of calcium, as well as other essential vitamins and minerals. Visitors asked so we responded and re-laid the train tracks in October 2017, ahead of the popular half term and Christmas periods. We have seen many little happy smiling faces whizzing by and lots of “choo choo” impersonations. Our resident animals enjoyed lots of enrichment activities designed by our keepers throughout 2017. Keeper Kathy who looks after our Spectacled (Andean) Bears shared the enrichment rota with us for you to see the range of activities and exciting treats that they get. Mechanical Ventilation in the form of extractor fans was installed in Vulture, Flamingo, Macaw, Snow Leopard, Tropical Bird House, Jaguars, Lions, and Tiger Houses during 2017, improving air quality and helping reduce ammonia odours. The Resident Roos got plenty of attention this summer, with the addition of Outdoor Kangaroo shelters in the World Wide Safari and a new Outdoor Enclosure providing access to the outdoors throughout the year. Whilst animal welfare has been our priority this year, works have been undertaken to improve visitor comfort including maintenance of paths in World Wide Safari Area, Repairs to Roofing, additional seating provision to expand Savannas Coffee Shop facility. Some of the work this year, has been fundamental in ensuring the site had continuous power, heating, lighting, water supply and had full planning consent. We had to lay a new mains cable into the latter half of the zoo which was previously supplied off the neighbouring properties supply; same for the water mains to the bottom half of the zoo, we had to apply for and were granted retrospective planning permissions for 2 of the buildings/ zones of the zoo – all what you may construe the boring but essential items. Think of visiting your doctor, they quickly pop a needle in your arm, draw some blood and send it off for testing…..Easy, right? Think again of how exactly you would blood test an animal the size of a Rhino?? Our Africa keepers can tell you after this year that it takes a lot of dedication and mutual trust! Our Africa keepers began by getting the big guys used to having a object directed behind their ears, building up to prodding them with a blunt object, then a heavier object…..eventually progressing to the testing needle. This means tests can be performed onsite in less time, giving the veterinary team speedier access to test results and providing prompter treatments. Aswell as the heavy work, our maintenance team flexed their design muscles this year for Halloween, Christmas and also in the design and build of a series of nest boxes and feeding troughs for our resident Macaws, Lemurs, Red Pandas, Squirrel Monkeys, Howlers and Capybara. There has been a Zoo on the site of Safari Zoo since 1994 and the natural look has always contributed to the ethos of the park, be it enclosures, landscaping or fencing. What comes with wooden, natural-look fencing is the need to replace. This year our maintenance team replaced all the baboon fencing and some area of stand-off in the World Wide Safari. Next in line is the Tapir and Maned Wolf enclosure which will, more than likely, be part of a larger redesign of the entire enclosure. We are uber-proud of our Christmas Markets which opened on the 25th November, selling gifts, experiences, adoptions and festive snacks to our Christmas visitors. Yes, they look pretty, however a big shout is needed to our maintenance teams for building these from scratch in just 19 days. YES, ONLY 18! Building commenced on Monday 6th November in the space between our Maki Restaurant and Education Room, and was completed bang on time on Friday 24th November ahead of the Christmas opening. This included waterproofing, insulation, power supply and stocking with tasty festive goods. Massive thank you to Travis Perkins Ulverston for supporting us in the build of our markets this year! “Simple” things like removing fences and giving animals more space can make a massive difference for very little effort. The demolition of fences around the mounds in the World Wide Safari area gave our resident hoppy Roos extra space and vantage points. On our Africa field the whole Savannah was opened up and removal of fences in the old Babirusa area provided shelter for our resident largest rodents the beautiful Capybara.